Nicky Lopez did everything a leadoff man could be asked to do for his team Thursday. And he notched a couple of personal milestones in the process. Kansas City's No. 6 prospect hit for his first cycle on the first five-hit night of his career, finishing 5-for-6 with four runs scored and two driven in as Double-A Northwest Arkansas crushed Tulsa, 17-3, at ONEOK Field. Fittingly, Northwest Arkansas' sparkplug went in natural order for his feat. Lopez singled to right field to lead off the game before hitting a one-out double to left in the third. The second baseman raced for an RBI triple to center in the fourth, the penultimate hit in a four-run Naturals inning and one that put him a homer away from a historic night. "Right after I hit the triple, I knew all I needed was the home run, but obviously you don't want to press. You don't want to try for it." Without pressing, he came through, belting a leadoff home run to right in the sixth. 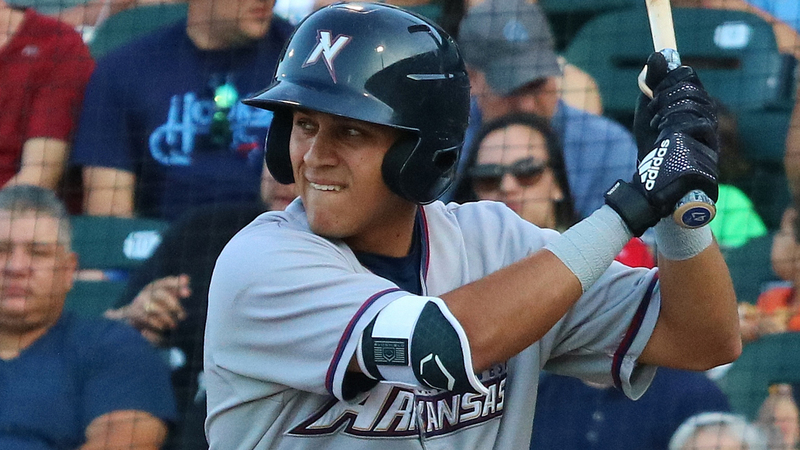 The homer -- just Lopez's second of the season -- opened a six-run frame, the biggest of five straight innings in which the Naturals scored multiple runs. "To be honest, I didn't swing any extra hard or anything," the Creighton product said. "I got a great hitter's count, 3-1, and I knew that he was probably going to come fastball. I just wanted to get the barrel to it. It was a down-and-in pitch and I just got to it. I didn't want to wait on it or anything. It helps when everyone's hitting. It was a great overall game, an exciting game, everyone was playing loose and playing free." The Naperville, Illinois product started over again in the seventh with a leadoff single to kick off a two-run inning. "As the leadoff guy, it is your guy to get on base, and that's my game," he said. "I'm not a guy who's going to leave the yard. It just happened that that happened today. As a leadoff hitter, I just try to get on as best as my ability can and then have my 2-3-4 hitters in the lineup knock me in. To be able to get on base and contribute in that way today was just a blessing and was good for our team. We had a pretty tough end to the first half, so to be able to come out and get after it for the second half, we know what we have to do. It was big for us." Prior to Thursday, Lopez had posted three four-hit games this season, including one on June 13. His cycle was the first in the Texas League this year and the first for Northwest Arkansas since Bubba Starling accomplished the feat on July 28, 2015. After a slow start in which he batted .250/.368/.275 in 22 April games, Lopez has caught fire. The 23-year-old hit .367/.408/.458 in 30 May contests and is .365/.417/.514 through his first 19 games in June to lift his 2018 overall slash line to .332/.398/.420. "I had a pretty good [Arizona] Fall League, and I had confidence going into the year," he said. "I know that this is a pretty big year ahead of us, especially with the things that are going on with the big league team, the trickle-down effect. I knew this was a big year going in, and I just wanted to get off to a hot start. I didn't, but I think having that confidence and having that success in the Fall League has helped me know that I belong on a big stage and I can do this. "I'm just glad that April ended because May was good to me." Nick Dini added two homers for the Naturals, who totaled a season-high five blasts. Northwest Arkansas piled up 16 hits, nine for extra bases, and went 5-for-11 with runners in scoring position.